A New York Times Notable Book of the Year, a Scientific AmericanBest Book of the Year, and a Finalist for the National Book Critics Circle Award. Review: This is without question, the freakiest book I've ever read. One of my best friends is an infectious disease expert with the CDC and recommended this. Honestly, I was thinking 'why would I want to read a book about infectious diseases, I'm not a scientist?' but I am so glad I read this. 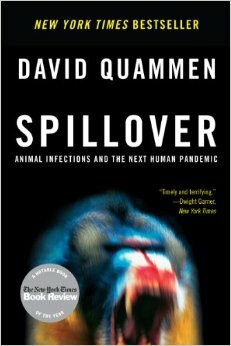 This book is about spillovers (when a microbe passes from animal to human as a disease). Quammen takes a detective type approach going from one disease to the next. He starts with a documented case, how the scientists and doctors treat/research/track etc. It was overall fascinating. There were some sections that weren't as interesting as others, but overall this was a fantastic read. Sidenote-I have ZERO desire to ever touch a bat, any sort of monkey/chip/gorilla or travel to Africa after reading this.